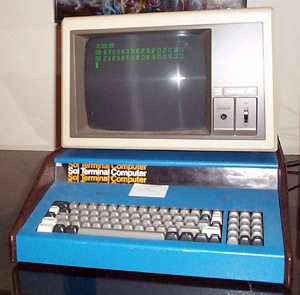 History : 11/16/00 : Acquired base unit along with an OSI C1P in trade for an Exidy Sorcerer. This was one of the earliest microcomputers I ever saw in action and one that was always high on my want list. Now I need doc and I'm looking for a disk controller and drives. The Helios II Disk Memory System was a duel 8" diskette drive system for the Sol-20 which, according to the brochure I have, "Under optimum conditions each diskette can store 384,000 bytes of information....Up to four dual drives (8 diskettes) can be accessed by the system so that over 3,000,000 bytes of data are on line." If you have one of these in your closet you'd like to see go to a happy home or you just want to pass on an interesting story about it, please send me email. Here is an old ad for the system but be warned it is about 274k.